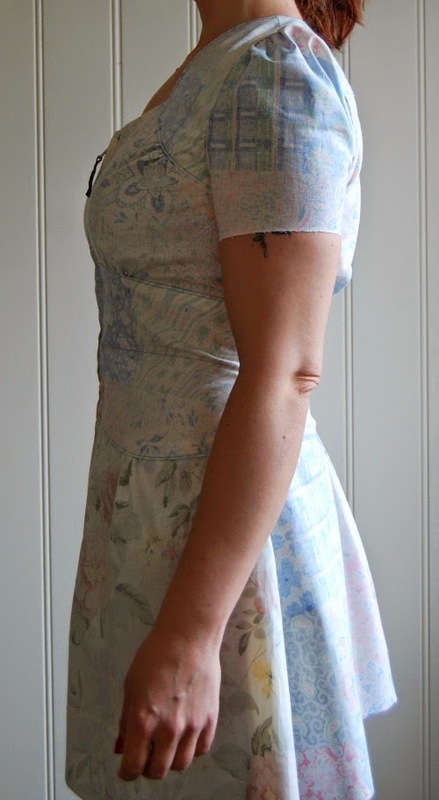 So the Ceylon dress is officially on the way now, and I've made the first muslin. I traced the pattern in a size 6, based on my bust measurement. 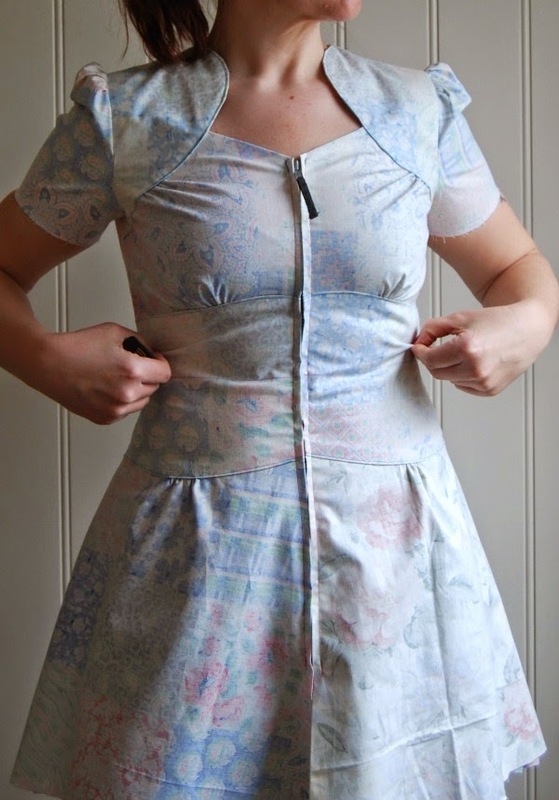 This way the dress would be proportionate to my upper body, and fit through the shoulders, neck opening etc. 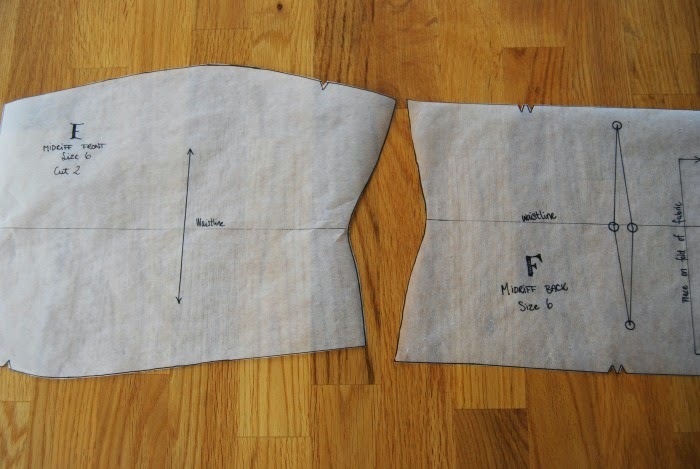 Earlier, I often chose pattern size based on my waist measurement, and ended up with more fitting issues in the bodice as it would be too big. Patterns with a 30" waist is usually for a 39" bust, or there abouts. 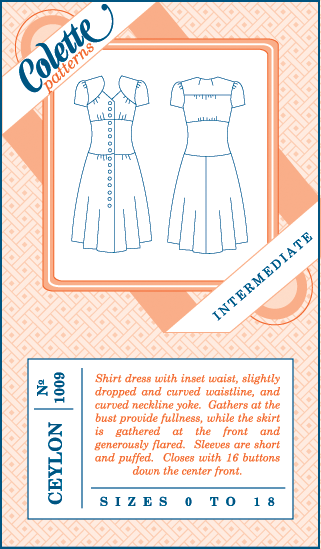 If I were to follow my measurements for the waist with this pattern, I would have gone with a size 10, which is for a 30 1/2 " waist (my actual waist measure). The finished garment would then end up with a 40 1/2" bust, and a very dissapointed seamstress. I have a small bust and narrow hips, so in this equation it is my waist that is unproportionate, and knowing this makes fitting more easy for me now. Knowing your body's uniqe caracteristics and proportions can help you tremendously. So this is Ceylon size 6 right out of the envelope. As you can see, it is a close fitting garment, but I honestly didn't expect it to fit my waist without alterations. I will be wearing appropriate undergarments with this dress, and I don't think I will add much to the waist. I want it to be "hugging" but not restrictive. Speaking of waist, there is quite a dramatic shaping in the midriff section, and I think that curve is slightly off in my muslin. It hits just below my natural waist, and rides up, creating a crease (see picture above). I am a bit unsure whether I should shorten the midriff, move the curve in the midriff, or shorten the back piece and thus raising the waistline. The sleeves are obviously to tight, and I might scoop out the armscye just a little bit in the back. I was also wondering if I should broaden the shoulders half an inch, so that the sleeve seam would hit further out, but I don't know if I need to. The puffed sleeve heads blur the lines, and my shoulders are plenty broad enough, and I might not need to emphasize that trait any more. As for the construction of the dress, it went together fabulously. The instructions are very simple to follow, no tricky bits. 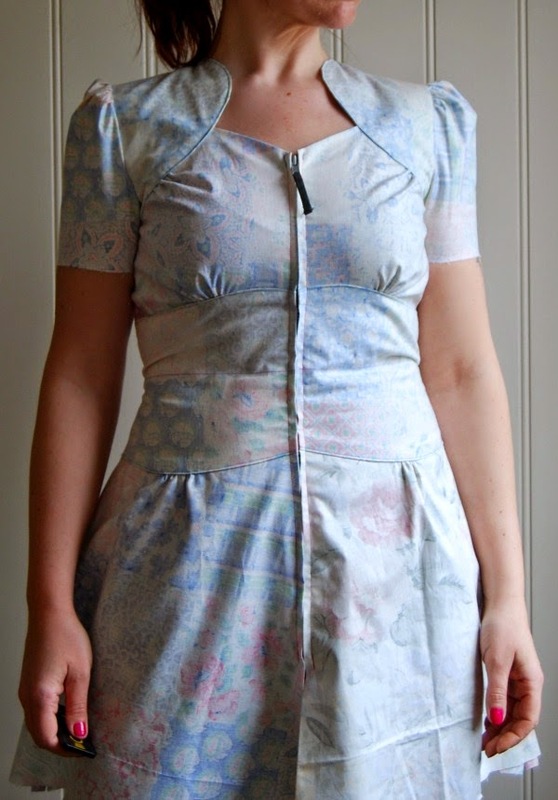 I believe the most challenging part of this dress is all of those buttons with their matching buttonholes. I had no need to put 16 buttons in my muslin, so I used a jacket zipper. I made sure to position the zipper where the buttons and button holes would line up, so there wouldn't be any fitting surprices later on. So, there it is! I really like the dress, dropped waist and all. 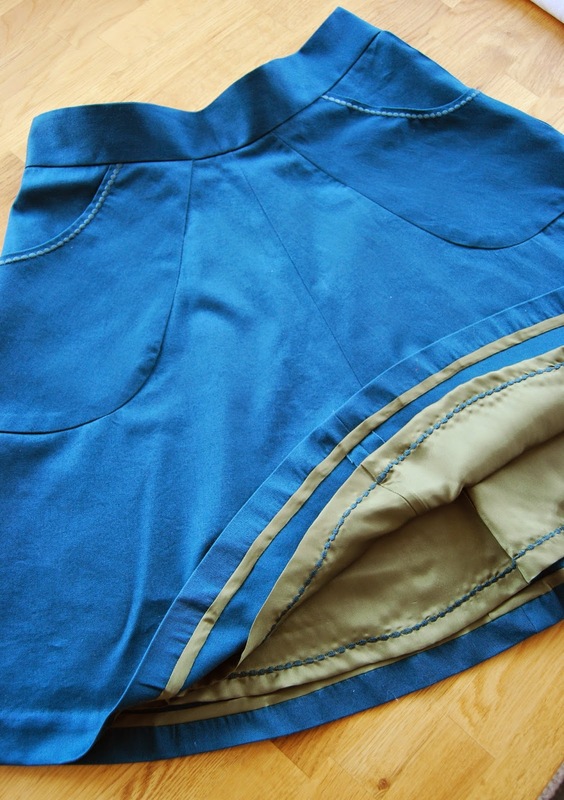 I also quite dig the zipper option, allthough the final Sew for Cotton-version will have buttons. I might make a wearable muslin next, with a zipper closure. New shirt and the closet-shrinking skirt! So I finally got to photograph my petrol skirt I made a few weeks ago. We got a surprice snowfall the day before yesterday, which gracefully covered all the mud in our backyard. And that spells great lighting! 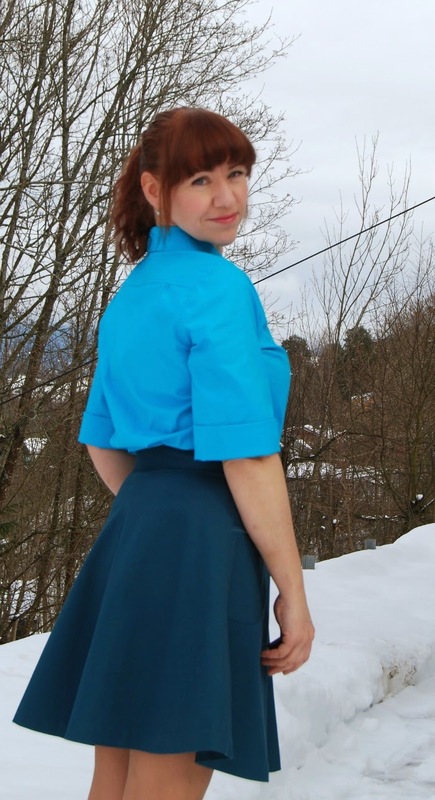 Since I finally found the shirt pattern of Win (Simplicity #2195), I wipped up another one last weekend, to wear with the skirt. I used the same fabric for this version as I did the first one. It's just some really cheap cotton canvas, which is great to work with and suits everyday clothing. The big plus for me is that it comes in so many lovely vibrant colors, and has no right and wrong side. Again, I picked one of "my recommended colors". I need a manned camera! 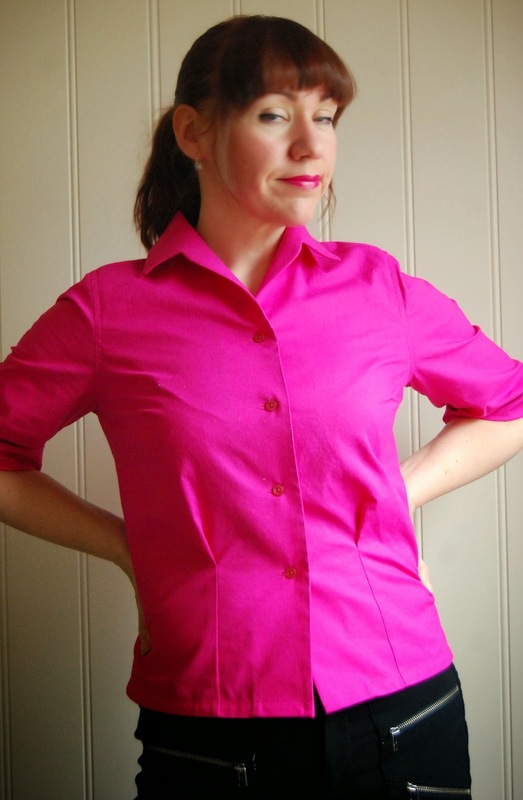 I love this new shirt, it turned out even better than the first, and now I don't have to dread making buttonholes anymore. 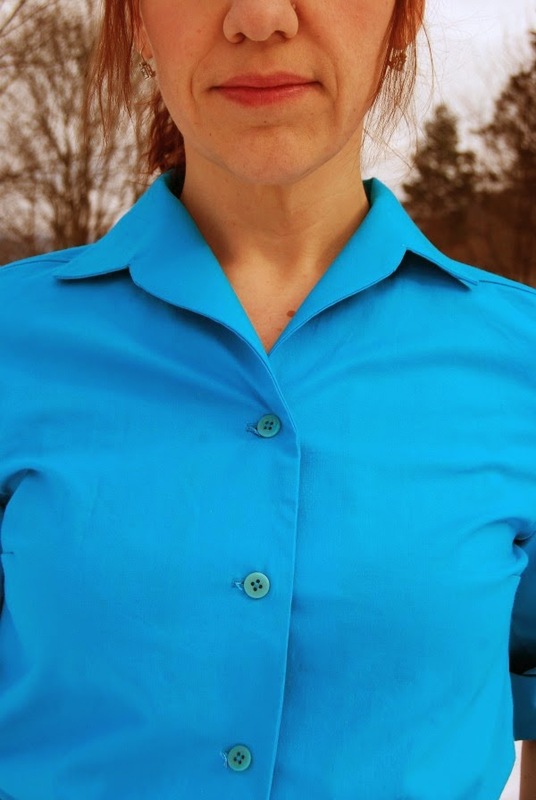 Bertha is a champ with her automatic buttonhole function, and they come out perfect every time! Yay! The skirt however, has fallen from grace. It seems to have shrunk in my closet. I could barely eek it on over the shirt! I haven't been running much the last few weeks, due to a ankle sprain that won't quite heal. It could be that I need a kick in the backside, so the darn skirt will fit again. I'm sure it will work out eventually. On another note, I am in full swing with my Ceylon dress. The pattern is traced and cut, now on to the muslin! Oh, and EASTER BREAK IS HERE!!!!! Yeehaw! There really is nothing like a sewalong or a challenge to get the creative cogs turning. Ever since I saw the Sew for Cotton sewalong announced, my sewing brain started to work on what to make. 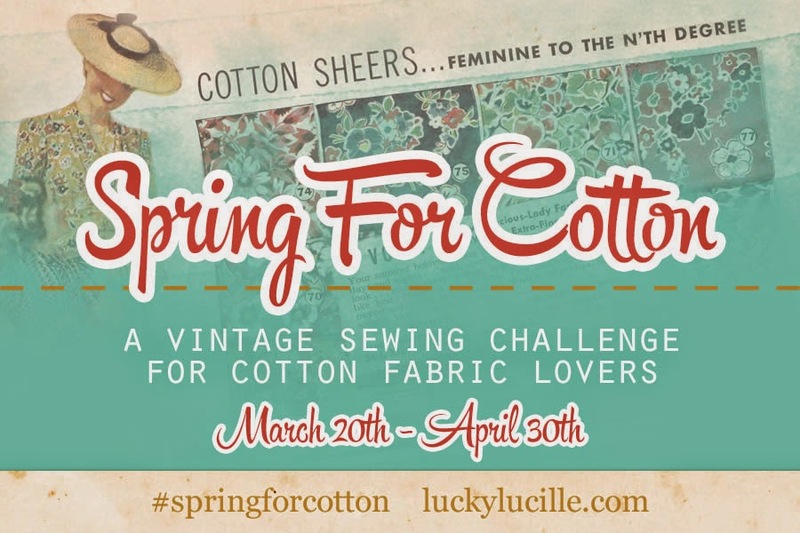 I instantly knew that it was to be a dress, it is a spring challenge after all! And plus; I really need me some dresses! 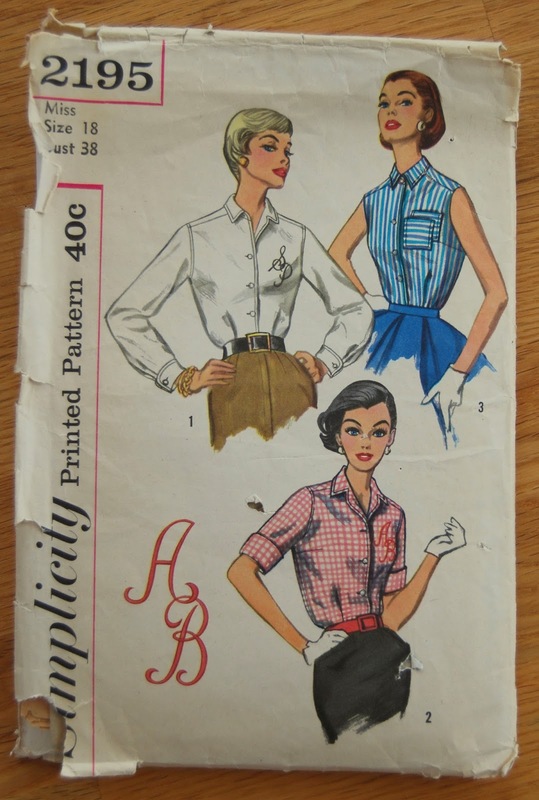 At first, I pondered the big full skirted 50s party dress with a halter neck. I already got the fabric for this one last summer, and planned to use the pattern for the striped sun top as the bodice (with some modifications). I have dreamed of this dress for a long time, but then it hit me that I would need a gigantic petticoat with that, and I was not planning on having a cotton one... Besides, the plan was to have contrasting satin details on the bust, and some slippery lining of some sort. All the "things" were just not lining up with the 100% cotton rule. So, the party frock got pushed back into que. I was going to have to come up with something else. 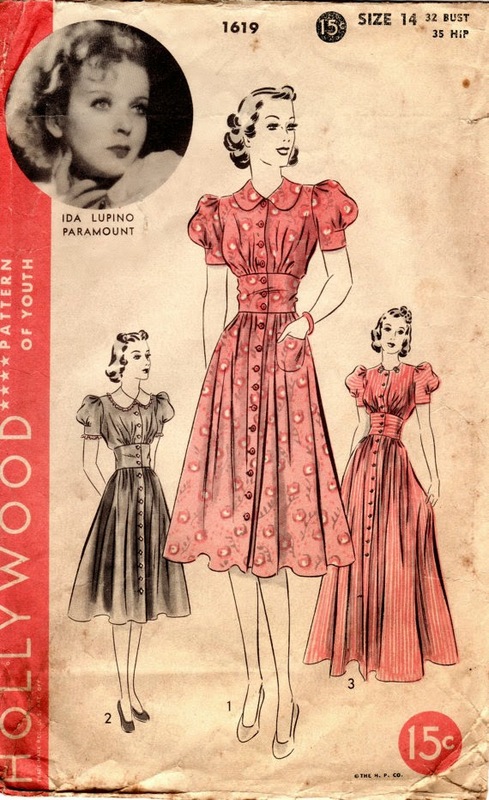 Then I concidered the 40s dresses. They don't usually require a big petticoat, and is more suitable for packing along in a small sportscar (with virtually NO space for luggage). 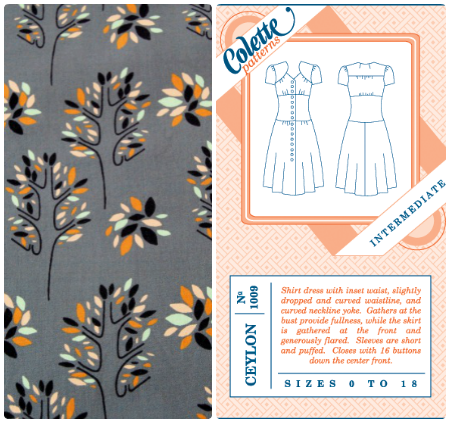 I dug through my pattern stash and found two candidates for the job. The Hollywood one was one of the first patterns I ever bought. It is only a copy and is for a 38" bust. At that time, I really thought I had a 38" bust, but really more close to 36". Hence all my early patterns are rather too big. 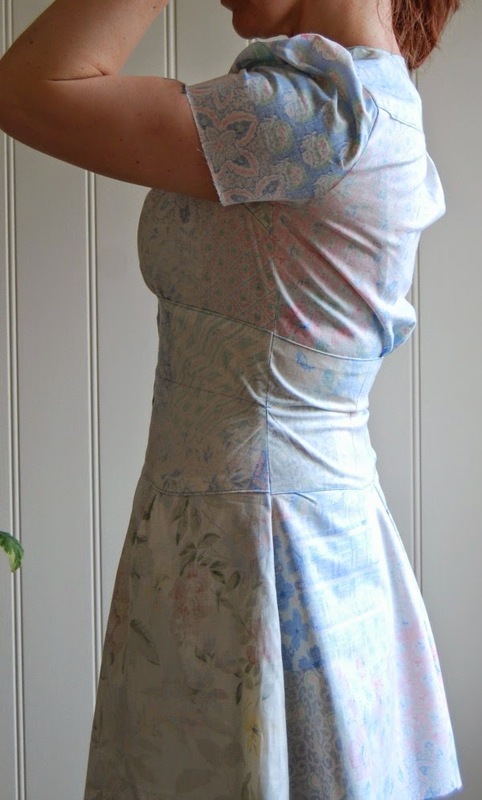 The second is the Ceylon dress from Colette patterns. I won this in a give away ages ago, and I feel kind of guilty for not having made it yet. Is there some sort of social convention that dictates a time frame in which you have to make use of the won item? 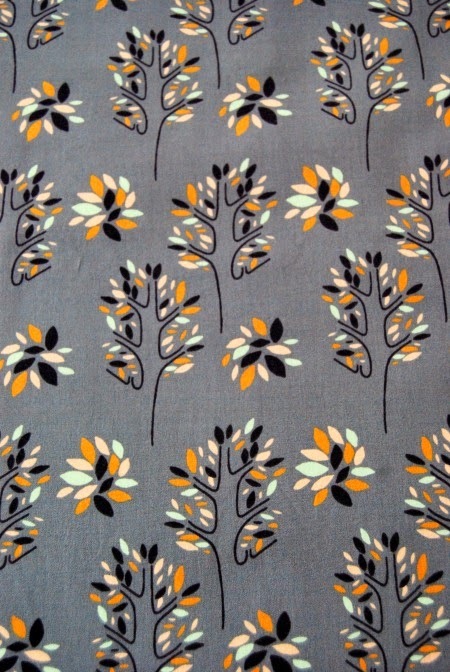 I have also won some fabric, and feel I should make use of it, but I do want to find the right project for it... (your valued opinions in the comments below;) But I digress! To make the story short(ish), I am using the Ceylon pattern. I think the neckline on the Hollywood one is too girly and cutesy, and maybe not my style. I really do like the shoulder yoke design, bust gathers and midriff section that you find is so many 40s patterns, and also the Ceylon. I am not sure I dig the dropped waist, but there will be a muslin so we'll see. It would be an easy fix to raise it. I got the fabric before I was set on the pattern. It was a bit of a spur of the moment buy, I loved the color way and cute tree print, and it's a nice soft organic cotton. When I got it home and washed it, I noticed when looking at it hanging on the line, that the print is not at all that randomly scattered as I wanted it. The repeats form noticable rows, and this means there will have to be matching. Sigh. I also worry the print is too big to work with this dress. It suddenly looked like curtain fabric. leaves are pink, aqua, ocre and black. I may be over-thinking things. In any event, I look forward to start on this project. 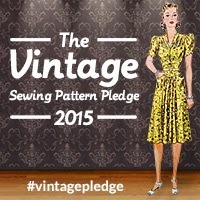 I have ten days of uninterrupted sewing time coming up over the Easter holidays . SWEET!! I shall not miss the factory one tiny bit. So, how is your planning going? All set? The Spring for Cotton sewalong! YAY! This sewalong was honestly perfect timing, as I need a kick up the backside to tackle dress sewing again, in time for warmer weather. I have an annual trip coming up in late May, with the Norwegian Sportscar Club, and need some great outfits for it. I wore some me-mades on last years trip and got lots of compliments, and that is always fun. Here I am in my Lobster suit, and although I have no photographic evidence of me IN our car, you'll just have to take my word for it. We always have a lot of fun on these trips, and it is a highlight of the season. naturally, we had lots to talk about! Hanging out, looking very cold. Which I was. This is the 2013 trip. I hope you are all doing well, and looking forward to easter break. I know I am! I just love the longer days, the milder temps and not having to scrape ice off my car in the mornings. These last weeks since getting Bertha the sewing machine, I have been in a creative wirlwind of planning, and procrastinating. Funny enough, I do not seem to posess the imagination to use anything from my stash. A part of it are fabrics very precious to me, that I am saving for the perfect project (sound familiar?) but for the most part my entire stash seems to be made up of weird, overly-floral stuff in unflattering colors. I think what I am getting at, is that I think I have evolved. I am starting to find my likes and dislikes, but also put down some more thought in what I am making. Lately I have been reading a bit about colors, and which of them suit different people. Since I am to cheap to splurge my fabric funds on getting a color analysis, I have come to the conclusion that I have a cool complexion, classified as a winter type and should keep to cool color tones. I find this stuff rather interesting, and decided to try out my new found knowledge. So, I made a shirt! This is Simplicity #2195 from 1957. I gotta tell ya, I love this pattern! It has the easiest collar construction I have ever tried, and it just looks great. 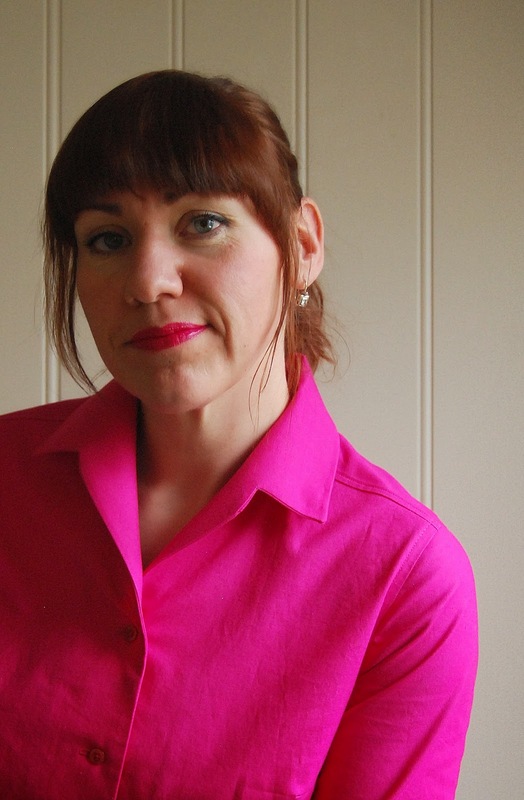 If anything, I would have liked it even more if the collar was bigger (but that's what the 70s are for!). 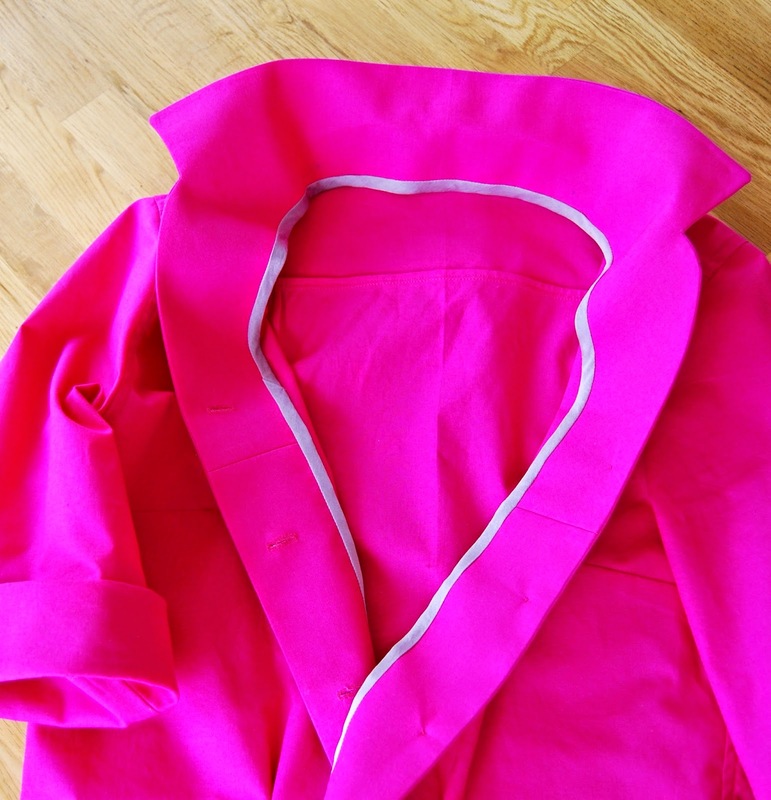 A simple under-collar is first easily sewn to the bodice, and then the interfaced front facings and collar are stitched on in one swoop along the collar edge. I was so pleased with it, I nearly cried a bit. 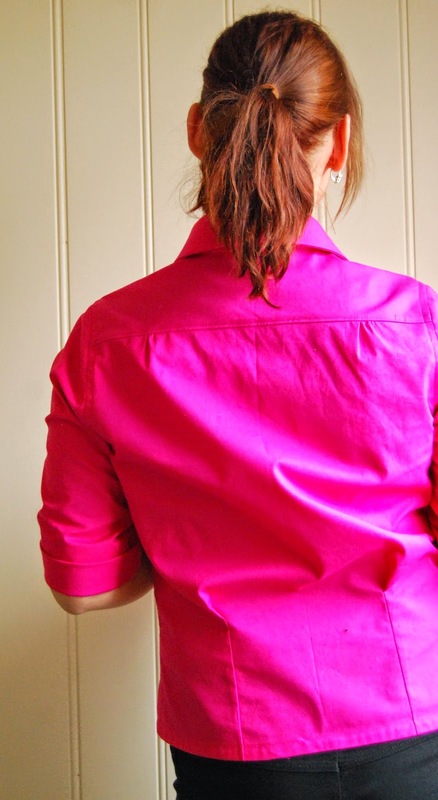 The rest of the shirt went together very smoothly, even setting in the sleeves went perfect on the first try, which never happens! The shirt has front and back tucks. I like them on the back, but the front ones add some pouf that I am a bit unsure of. 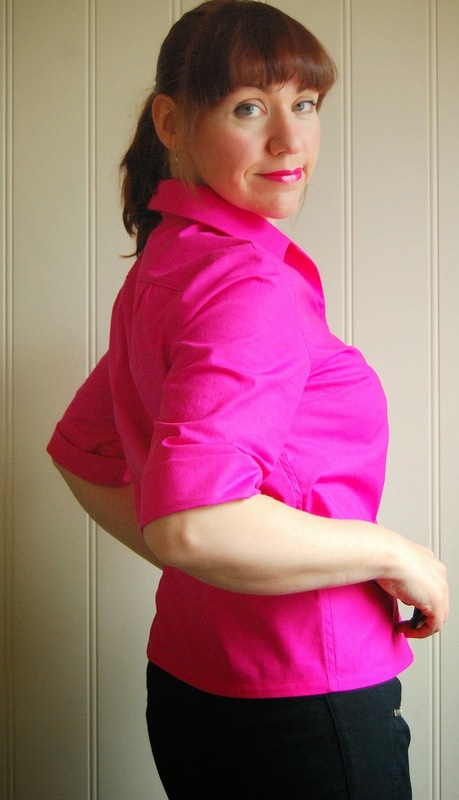 As demonstrated by the pattern cover art, this blouse is for tucking into skirts and pants, and then the front tucks will make more sense. Next time, I think I'll tinker with them and maybe make them into fisheye darts. OMG. I look like I've had a case of wine. The sleeves was also brilliant to make, no cuffs or other nonsense, just folded up and slipstitched on the inside. 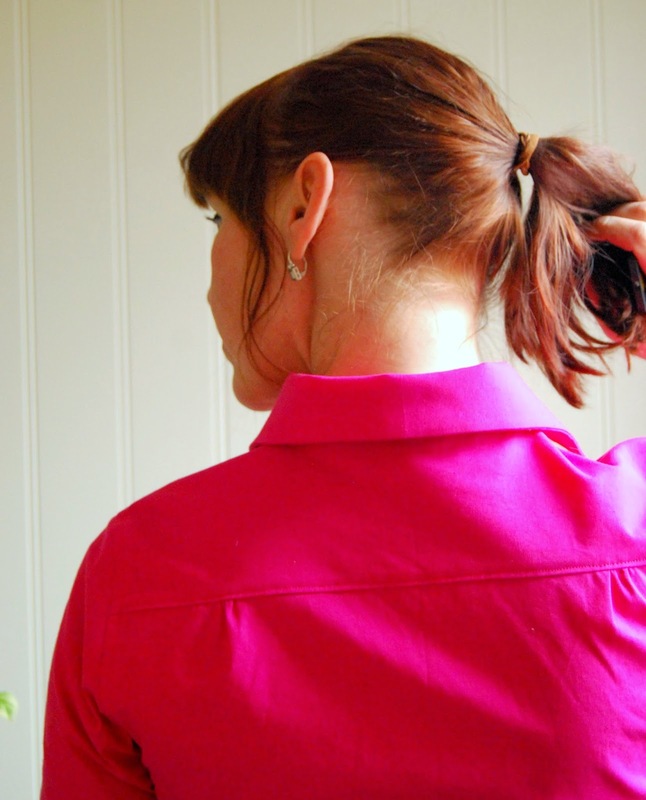 They are the perfect length I find, as I always keep pulling up my sleeves on sweaters and shirts, when cooking, sewing, knitting. No need here, as they're never in the way. Top stitched yoke, and gathers at the back. 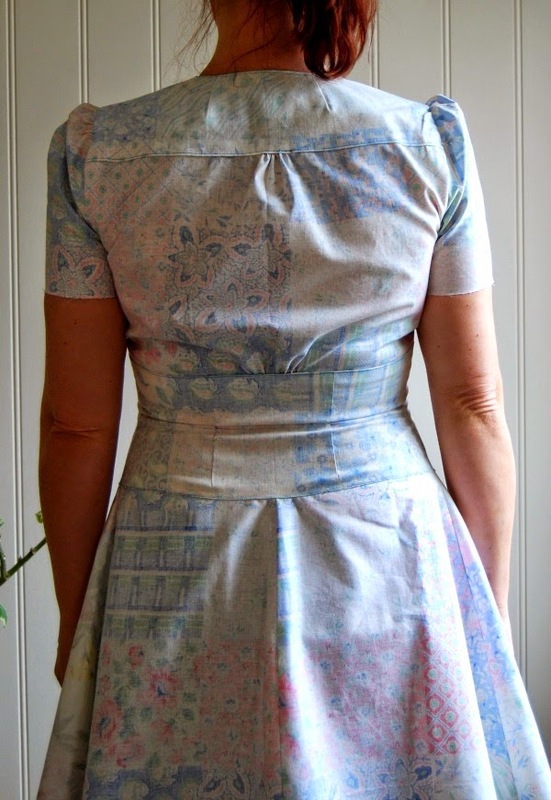 I finally had time to sit down with my new (to me) sewing machine, and have a go at sewing again. Let me tell you, it was great, but I disovered I was a bit rusty, and needed an easy project to begin with. 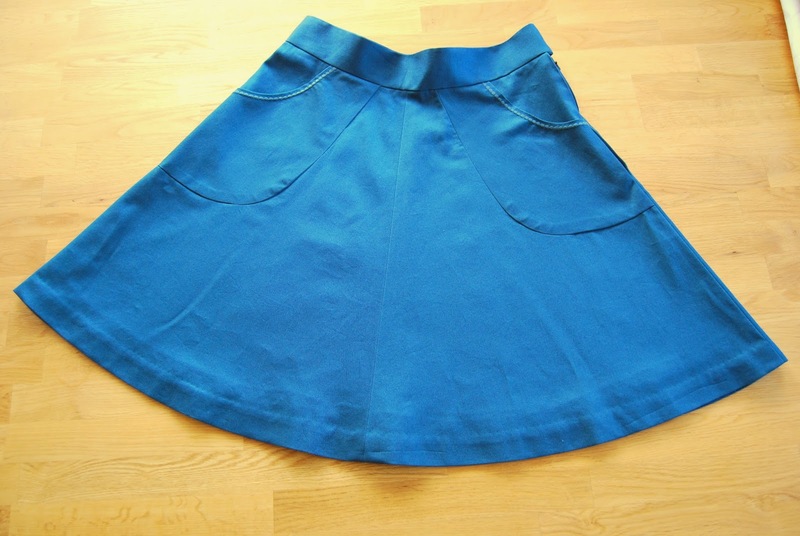 So out came the skirt pattern I used for my 70's linen skirt. It's the Simplicity #5918. To date, that skirt has become my most worn item of all I've made, so another one would be a total win! I rummaged through my stash and declared I had nothing that was skirt appropriate, so there was a bit of shopping, too (win#2)! I got some cotton twill in a nice petrol blue that will go nicely with the Victory jumper I am currently knitting. After deciding I wanted to upgrade the first version a bit, I found some green acetate lining in my stash and made an effort to do it "properly". I even did french seams on the lining....oh la la. Small details makes a big difference! The hemming is always the worst part for me. I spent an entire day on this.... The hem on the first version looks rather aweful, the linen was so thick and I made them hem too deep for it to lay nicely. So I was determined to have this one look better. 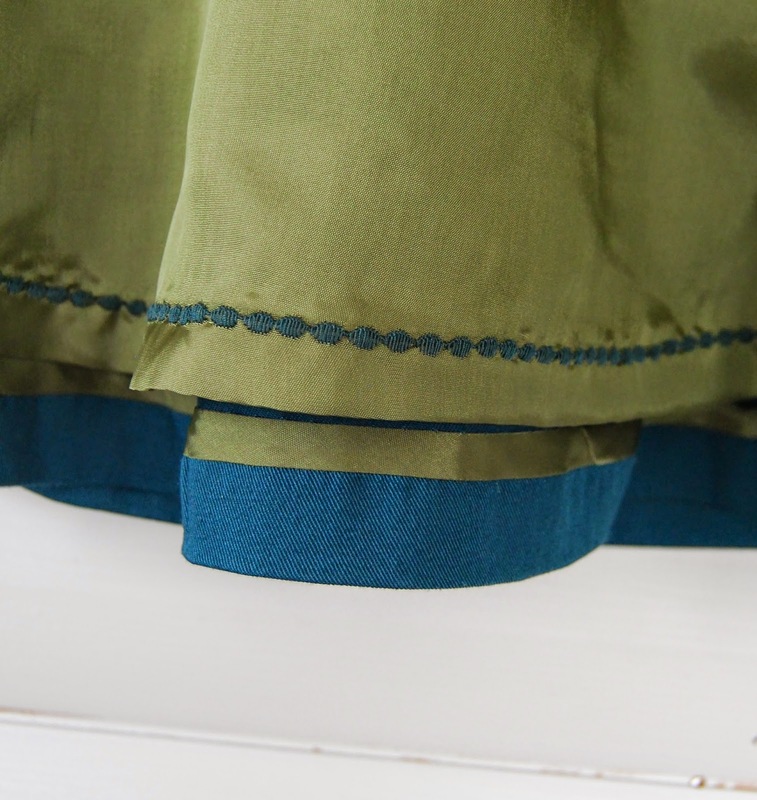 I wanted an invisible hem, and to make it extra fancy, I made bias tape out of lining material to cover the raw edge, and thus kept down the bulk. The hem was then hand sewn. Killed my back, but oh so worth it. At this point, the thought of hemming that slippery lining too, struck the big fear in me and I got a bit creative. 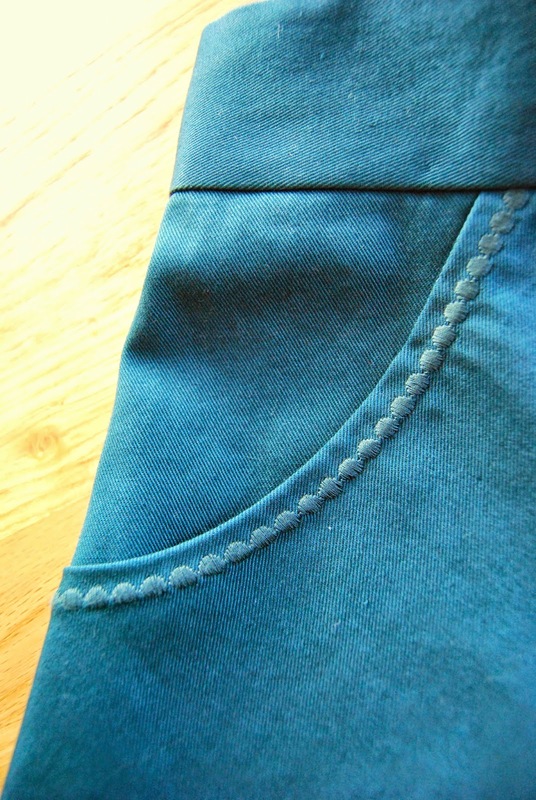 I just folded the edge once, and used the decor stitch again just on top of the raw edge and got a cool and easy hem that way. It looks great on both sides, so that goes into my success account! If anything, I am a bit annoyed that the lining ended up a little short, but I can live with that. I know it's pathetic, but those pockets makes me proud! I really like that bias bound hem. 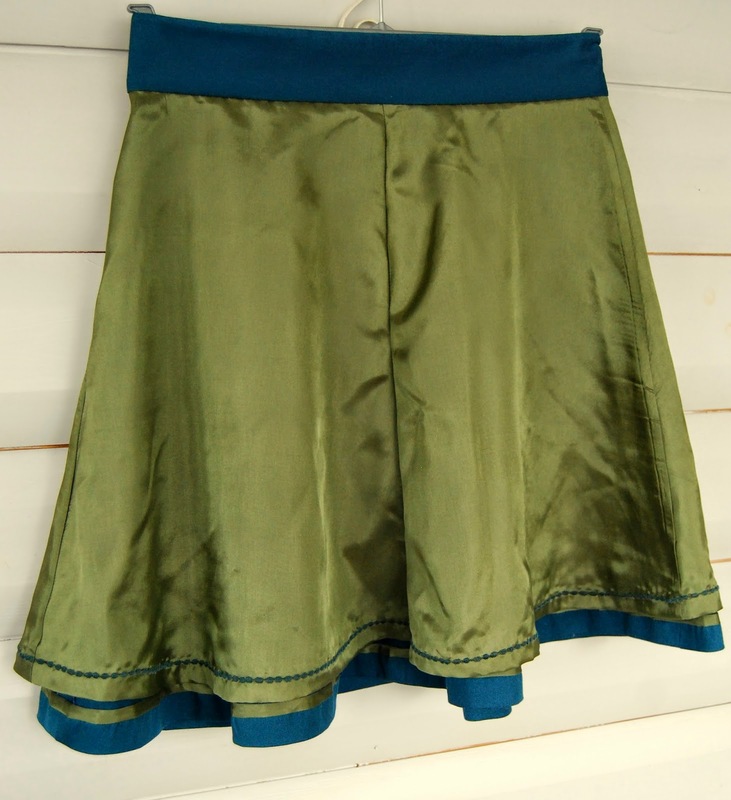 All in all, I am very happy I made some extra effort with this skirt, as it turned out rather nice. I am also very happy with my machine. She sews like a dream! Now, I just need to get a hook and bar to put in that waistband, and it's ready to wear. I know hanger-photos are kind of unenchanting, but I just had to share my excitement! Did you make anything exciting this weekend? Do tell! Wait! What? Is it Christmas already??? Warning: exclamation mark heavy post. Good grief, I am SO excited!!!! After what feels like an eternity (of three and a half months) without a sewing machine, I may very well have hit the Jackpot! Pardon the blurry photo, I think my hands were shaking. 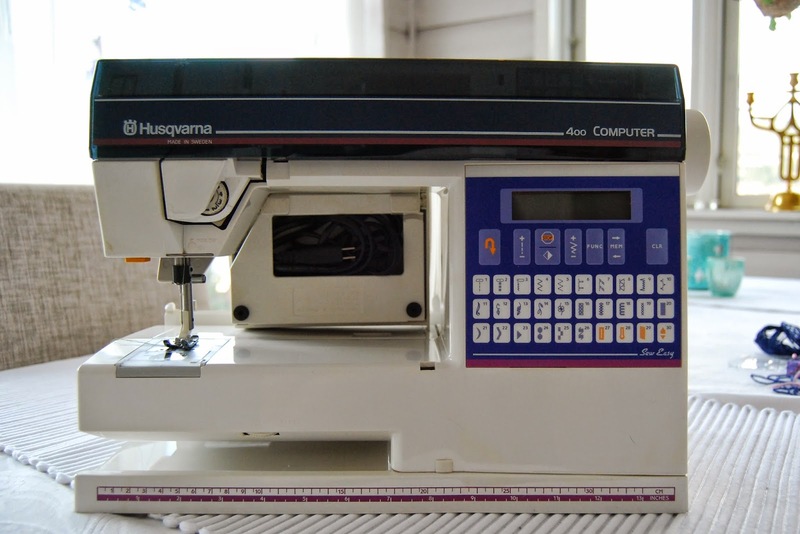 Meet the new (to me) partner in endless sewing bliss; Husquarna 400!! Isn't she a beauty? I think so too. But it isn't all just a pretty face, she has brains, too. I have only had time to browse quickly trough the manual, but there are loads of programming options. There are many lovely decorative stitches, (flowers, leaves and borders etc), all you can ask for in "utility"stitches and even a menu of letters for monogram embroidery and such! 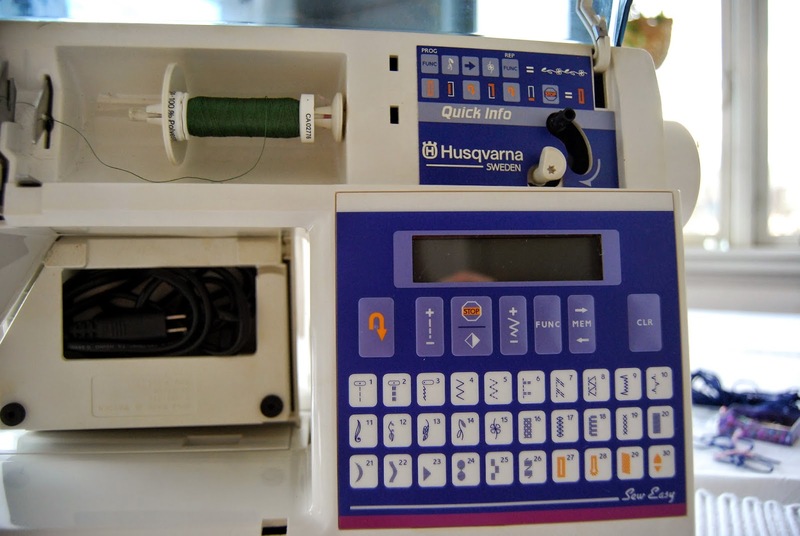 In total there are 220 different stitch options, oh my! I can hardly wait for the weekend to arrive, so that I can play with her. It's gonna be awesome!